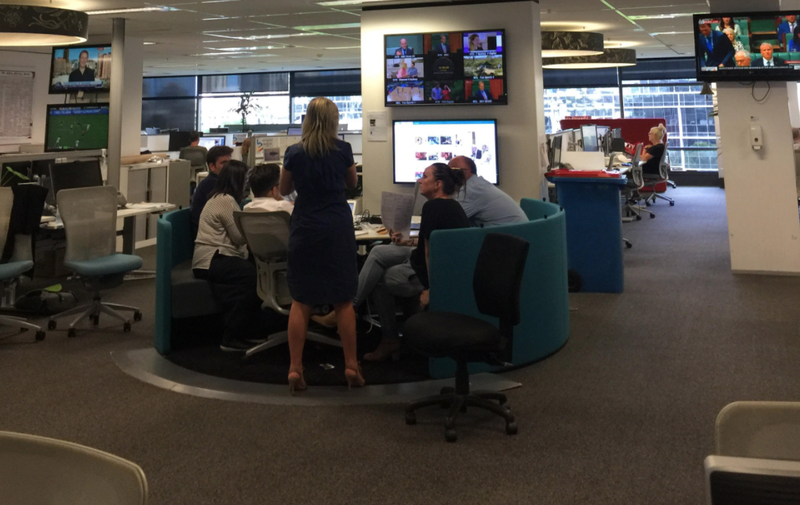 Lisa Davies, editor at The Sydney Morning Herald, gives Mumbrella readers a glimpse into life inside one of the country's biggest newsrooms. I have never been much of a morning person, but most days a combination of adrenalin and necessity get me up at this hour (or earlier). Today I planned to go for a run. I want to run The Sydney Morning Herald half-marathon in May, so I’m trying to get in shape. But I was up late last night dealing with a late-breaking story, so I don’t feel much like it. So, in the spirit of transparency, I hit snooze. Repeatedly. Check emails and read the competitor publications, while skipping around the radio stations, then use our new ‘Shortlist’ feature on the Herald site to compare our treatment of stories. Sometimes I pause on the AFR for a longer read until I get to the office. In fact, depending on how many times I’ve pressed snooze on my alarm, sometimes more than one masthead falls in that category. Hit the office shortly before morning news conference. This is a national hook-up involving our sister newspaper The Age, as well as our colleagues at the Canberra Times and Brisbane Times. This is immediately followed by a state-based conference. At both, we discuss the big news of the day, focusing on what will be our digital focus during the big lunchtime peak. Our new site places even greater emphasis on strong photos so we also discuss story presentation. It’s Tuesday, and each week I do a “What’s Making News” segment on ABC 702. This is where I discuss with Wendy Harmer and Robbie Buck the big stories engaging readers online this morning. Our new ‘Comment’ feature will be really useful to get an instant view of what’s engaging our audience. I have some external visitors coming to meet me, and I’ve invited some senior journalists to come along to this one. The visitors are important stakeholders on some high profile Sydney issues, so over coffee we discuss the trajectory infrastructure projects and how the city’s landscape is changing. These are “off the record” chats, but important to be able to see all sides of these issues. Lunch. While I have many lunch engagements outside the office, today’s is a salad at my desk, catching up on the news of the day so far. Afternoon news conference. Again, the format begins with a national editorial hook-up, with particular focus on business and federal politics, and then into a state conference. At the end, the picture editor runs through the images gathered so far (my favourite part) and we discuss what is going to lead the newspaper. Sometimes it’s easy – the page one stories are obvious. The biggest issue is that many stories are still ‘moving’ through the afternoon, and some key photo options that have yet to be taken, so you have to make sure there is some flexibility in the planning as we go through to deadline. Quick meeting with our marketing team to discuss the recent launch of the Herald’s website, and touch base on a couple of events I’m required to attend. 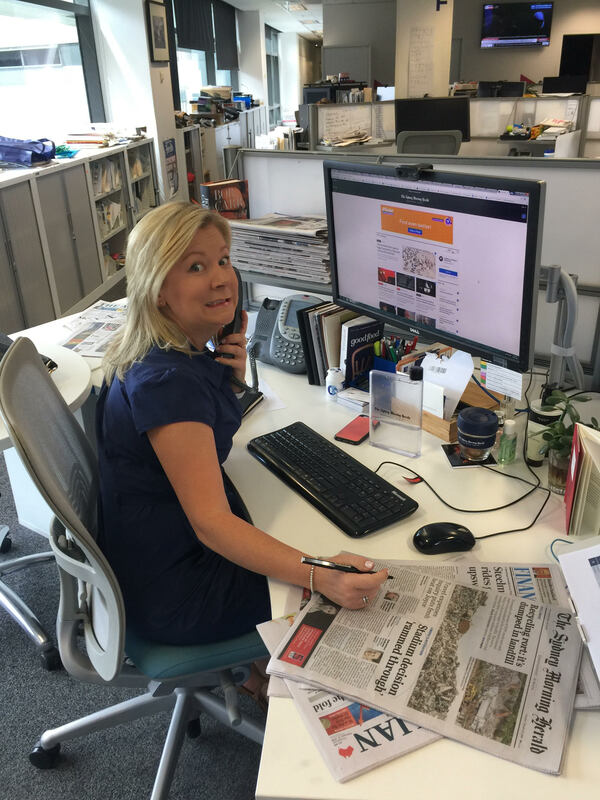 While the print team gets on with compiling the newspaper, I get through some emails and focus on my weekly “Editor’s Note” to subscribers. This weekly missive is designed to take subscribers behind the big news events of the week, by providing insight into stories or processes taken around the publication of various things. This is regularly interrupted by discussions with news director or news editors about stories, how different things are playing out. We update the website for the commuter peak at around 4pm, and depending on the news cycle this can also be a good time launch a big exclusive or project. Check in with the print team. This is like the old “page one” conference, but a little more informally. Stories have often changed or developed so at this conference we discuss how that has affected our earlier decisions. I read the letters and opinion pages in detail before deadline. They can be a great source of insight – especially the always-passionate communications from our readers! With the newspaper well on its way to deadline, and a few simmering legal issues resolved, I head out to dinner with a senior politician (not saying who!) It’s an informative discussion about policy, progress and the Herald’s positioning on them. New format, same humble brags. Actually in this case not so humble. My favourites were, “Lunch. While I have many lunch engagements outside the office…” and “I head out to dinner with a senior politician”. That’s not bragging, that’s just a day in the life of a newspaper editor. Networking with Sydney’s movers and shakers across all sectors is actually her job. Has this changed to a sponsored format? More product plugs than a day time TV infomercial.